"My son was born with the congenital disorder Sturge-Weber, now we try to give him what the genetics denied him"
This is the story of Carolina and her son Alejandro, who was born with just 25 weeks and a rare anomaly that affects the blood vessels of the brain and causes seizures, glaucoma and other health problems. His own mother explains, in first person, what it is and what are the challenges they have had to face, now that he is turning 5 years old. A smile cheers up my days since that summer of 2013 when my life suddenly changed. But what do you do so that smile does not disappear? When you are the mother of a disabled child, everything plays against you to achieve it, but your son always brings you back to Earth with gestures that charge your energy, with a type of love that knows no physical and cognitive limitations. I remember reading the chapter of the 25 weeks of pregnancy in "What to expect when you are expecting" a day before my son Alejandro was born unexpectedly. What author Heidi Murkoff described in her book I was able to confirm it when I finally saw my baby in his incubator. His skin was sticky and covered with hair like a peach. His body, fragile and connected to many tubes, almost fit in my husband's hand. His eyes were open but unable to see my tears. And a red mark on the middle of his face indicates a shadow that will become even greater in his future. Soon after, a severe diagnosis confirmed an inevitable truth. His life was not only at risk for being so premature. Prematurity caused a brain injury that would affect his motor development and a chronic respiratory condition that clung him to a respirator. Also, that port-wine stain on his face, as the doctors told us, was one of the three indisputable signs of the Sturge-Weber syndrome, "a non-familial congenital disorder caused by the mutation of the GNAQ gene" that affects the blood vessels in his brain. It took only some weeks for the other two manifestations related to this congenital anomaly —glaucoma and epilepsy— to appear. Almost five years later, it is still difficult to understand what went wrong, but the truth is that there has not been a single day of rest in our struggle to give him the opportunities that genetics denied him. For me, being a mother has always been like walking on a tightrope. After that unexpected day when I arrived by helicopter at a hospital in Neptune, NJ, I spent four and a half months living in pediatric child care units (NICU) and in homes where friends and family welcomed me without expecting anything in return. Only two months after we finally went back home in New York, our baby started to have seizures. Since then, Alejandro and I spent ten months in an intensive care room at NYU Langone Medical Center and at NYU Rusk Institute for Rehabilitation Medicine, trying to be a united family with my husband and my other son despite living apart. Among many complications, my little boy required a hemispherectomy on the left side of his brain to control non-stopping seizures. During the seven or more hours that operation lasted, my heart seemed to stop beating. When the effect of the anesthesia ceased, my child contradicted —as he has done many times in his short life— the medical prognosis: the right side of his body was not paralyzed. But one coma after another kept him connected to a respirator and several sedation medications submerged him in a deep sleep, from which he did not wake up even when we were celebrating a "due-day" birthday party for him at the NICU. There were days of uncertainty and agony, when for moments I lost my faith and, at the same time, I believed more than ever in miracles. One of those days was when he woke up and smiled as always. The instinct of his neurologist Judith Bluvstein—who diagnosed him with early hypothyroidism, which it is common in many patients with Sturge-Weber— made me realize that medical specialization is just a label. Luckily, she is always looking beyond her specialty. Three times doctors tried to remove his breathing tube. Only the third one, doctor Arun Chopra did it successfully. Everything was ready for Ale to get a tracheotomy next day, but once again Alejandro imposed his will. His respiratory problems will continue for life, but the successful treatment prescribed by your pulmonologist, doctor Mikhail Kazachkov, has saved us from many trips to the emergency room. Twice a day my son receives chest physical therapy with a vibrating vest —which he believes is the most fun thing in the world—. He also withstands forced inhalations and exhalations when using a cough assist machine that helps to expand his lungs; and he inhales Albuterol vapors using a nebulizer to open his airways. There have been countless episodes in which I have had my child's life in my hands, but I have been able to hold it tight without doubt, following every advice given to me by doctors, nurses, respiratory technicians and therapists. These have been our allies who I admire and respect, although sometimes they have failed. 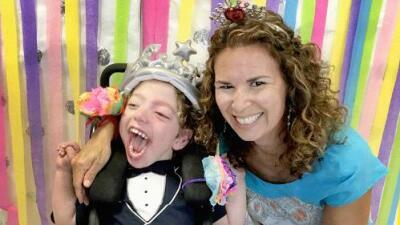 Alejandro's diagnosis includes cerebral palsy. His brain, already affected by the injury with which he was born and the Sturge-Weber syndrome, does not connect with his muscles properly. The high muscle tone makes you believe sometimes that you can break one of his legs trying to change the diaper. Looking at people pass in front of him is a superhuman effort for Ale, due to the severe hypotonia that affects his head and trunk. Alejandro's small body has endured about 15 surgeries and there will be more in the future. These past five years I have learned to be an untitled doctor. My child's doctors listen to me —as they say— "because nobody else knows him so well and knows what to do". Working with their doctors and therapists as a team has been the key to gain their respect, but also to learn how to navigate the complicated health and education system for people with disabilities. Almost since he was born, Alejandro has received physical, occupational, language and vision therapies (cortical visual impairment and glaucoma are also some of his disabilities). Thanks to the advice and unconditional support of his pediatrician Amy Demattia —his "Guardian Angel"—, he received therapy and other services paid by the New York Early Intervention Program, until he was 3 years old. After a long hospitalization, Medicaid has covered those medical expenses that my husband's private insurance does not pay. Only the bill for his NICU admission that lasted three and a half months exceeded five million dollars. You really need to have nerves of steel for not to give up trying to make the system work for you. My son will turn five at the end of July and we will celebrate it on the same beach where he almost decided to be born, shortly after my husband took the only picture of me, pregnant with incipient belly, that I have. Today Ale goes to a school —Roosevelt Children Center— that it is like his second home, where his teacher, therapists, paraprofessional educators and everyone follow his progress that it is limited by his fragile medical condition, but it is unstoppable by his strong soul and incessant joy. At his school, Alejandro is learning to overcome his limitations to communicate using an Ipad, provided by the NYC Department of Education. His creative teacher designed a switch that his weak arms can move to activate the computer. With that device that my son wears on his wrist like a bracelet, he reads e-books on a giant screen, participates in board games with his friends, says "yes" or "no", selects colors and recognizes faces and objects. These are small steps for almost everybody, but for us they are the key to a future with a certain autonomy. The most recent project of his teacher has been a customized, motorized toy car (a Hot Wheels by Mattel adapted by Access Redefined). Ale is learning to move the car by himself using his motion switch. For another child, that car is another toy; for Alejandro, it is not only an instrument to reinforce what he has learned in school to communicate and do what he wants, but also it means that maybe in the future he may be able to use a motorized wheelchair independently. But Alejandro may not be as lucky as he is now that he must enter kindergarten. The Department of Education guarantees him a placement at a public school. However, we have not found where he can received the high quality of education and care he requires. After having a meeting to define your individualized education plan (IEP), it was determined that you should go to a private school. Now we are waiting ... and about to start a legal crusade for the DOE to guarantee an appropriate education in a restricted environment for him. The tuition fee in a special school that promises the care and specialized education that he needs is expensive: $135,000 per year. It is not an easy challenge for us to get the financial assistance from the State to pay for it, but we trust that Alejandro' smile once again will prevail. My husband and I have worked since we were teenagers. We always believed that at this time of our lives, we would be financially solvent and we would have everything covered. After having Alejandro, everything has changed. The numbers do not match despite all the services that the State and our health insurance satisfy. We are frightened to think what would happen if the Government advances in its idea of cutting funds to public health programs. To celebrate Alejandro's five years we decided to start a fundraising campaign to fulfill three wishes that would improve our son's quality of life. If you want to donate, click on this link. Born too early. More than half a million babies are born prematurely and with birth defects in the United States. Learn how you can improve this reality. A gene that opens doors. The Kennedy Krieger Institute in Baltimore is the authority on Sturge-Weber syndrome research and its researchers discovered the genetic malformation that causes it. To learn more about this disease, go to this link. Also the Sturge-Weber Foundation is trying to create awareness about the Sturge-Weber syndrome. Pain for life. 50% of people with cerebral palsy live with pain. Find out more about this illness.